A few days ago I ran into the post office to mail a couple of cards. One of said cards was square, which means I had to pay for additional postage. There was a short line, so I took my place and waited. With only one employee behind the counter, the line got longer and longer as the next customer stepped up to the counter with a tote bag full of packages to be weighed, stamped and paid for. 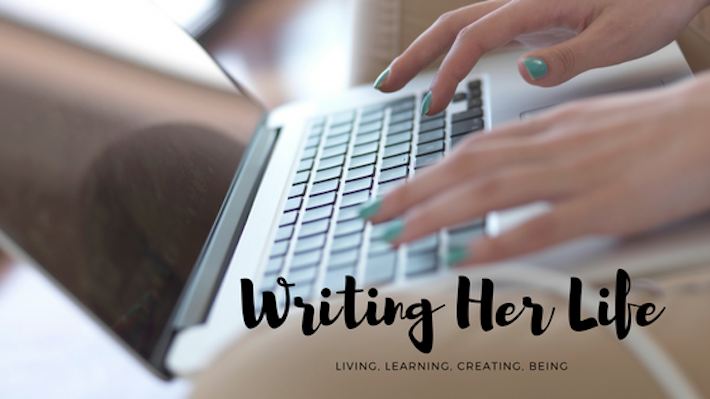 The gentleman in front of me huffed and puffed, sighing loudly and shifting his weight back and forth dramatically. The woman behind me tapped her pen on the table beside us until she finally called out to another employee who was clearly working on something other than customer service, "Can I just find out if I have enough postage on this?" The employee smiled and calmly instructed her on how to use the self-mailing station to weigh and determine the postage for her package. In the meantime, several customers entered the building, looked at the line and promptly turned around to leave. The line was not that long. There were about four people behind me and three in front of me. From the time I stood on the line to the time I walked out the door, about 10 minutes had passed. And yet from the patrons' responses, you would have thought we were waiting for hours. I admit, my first reaction in seeing the line and the one poor employee standing behind the counter, was a silent groan. 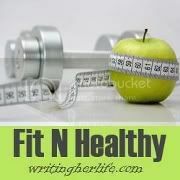 But in the waiting I had time to take a few deep breaths, plan my dinner, and mentally check off my to-dos. When it was my turn, I stepped up to the counter, smiled at the woman helping me, paid for my extra postage and went on my way, thankful for ten minutes in which I didn't have to do anything. Oh, the joy of fresh vegetables straight from the farm! I can't tell you enough how much I love knowing exactly where and how my vegetables are grown. It's really starting to get good. Blackberries are around the corner. Tomatoes are starting to ripen. Cucumbers and zucchini are on the way. I'm already preparing to freeze and maybe even can some of the extras because if the rest of the summer is anything like last year I'm going to have a hard time using up my share. I just finished cooking and immediately eating the best dinner I've had in ages. 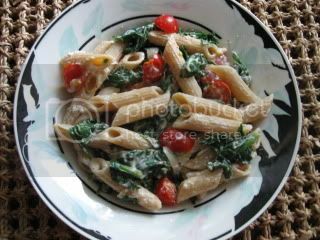 This recipe, inspired by one I saw on Giada, had three of my favorite ingredients: pasta, spinach, and my new love chevre. The resulting pasta dish was creamy, rich and full of flavor. Trust me, you want to try this one! Bring a large pot of salted water to boil and add pasta. Cook and then drain, reserving at least 1 cup of pasta water. Set aside. In a large skillet, heat 1 tsp olive oil over medium heat. Add garlic and onion, cooking until the onion is soft and beginning to caramelize. Toss in the spinach and tomatoes, heating until the spinach is just wilted and still bright green. Remove from heat. Add the pasta to the skillet and crumble the goat cheese over it. Stir or toss with tongs until the cheese is melted, adding enough of the reserved pasta water to create a sauce. Add salt and pepper to taste and serve. 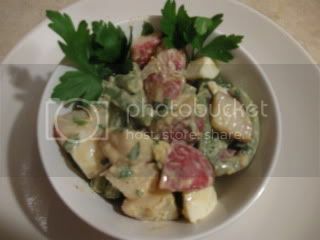 This week's featured local meal consisted of a large helping of my newest salad obsession: Potato and Green Bean Salad. I really wish I'd taken a picture, because it's pretty to look at, too. I brought home a great haul from the farmer's market today and I'm looking forward to getting creative for my local meal this week. I've got eggs, fresh spinach, onions, an eggplant, green peppers, a cucumber, mozzarella cheese, white peaches, Summer Rambo apples, and apricots (probably the last of the season). That will be supplemented with what I'm expecting to be a pretty good share from the CSA this week that will probably include chard, scallions, potatoes and lettuce among other things. I'm also planning to pick up some local goat cheese. Any ideas for local meals using these ingredients? Feel free to share suggestions. I'm feeling adventurous! Last weekend we had a potluck on the farm and I met some fellow CSA members. We took a tour of the farm and learned why things have been a little slow to produce and what to expect in the near future. We're talking floods of tomatoes, beans, chard and more! I'm so excited to have more potatoes because I made the most flavorful potato salad I've ever had and I can't wait to make more! Give it a try and see why I'm so excited about it. Add the potatoes to a pot and cover with water. Bring to a boil and cook until almost fork tender. Add beans and cook another 4 to 5 minutes, until beans are bright green and potatoes are cooked through. (You can also steam beans separately while potatoes cook, which is what I did.) Drain potatoes and beans and set aside to cool. To make the dressing, whisk mustard, honey and vinegar in a large bowl with a cover. When potatoes and beans are room temperature, add to the dressing along with the parsley and egg. Tightly cover and toss until everything is coated. Add salt and pepper to taste. Refrigerate until ready to serve. *I actually served the salad at room temperature, but it would probably be great after a few hours in the refrigerator, too. This week I found myself scrambling yet again to make my One Local Summer meal. It was Saturday already before I realized, while I'd been eating a lot of local dishes, I hadn't planned and prepared a fully local meal. So I sliced up a sweet and juicy local tomato, pulled some local lettuce leaves from the refrigerator and placed them both on a local sandwich roll. I made up some chipotle mayonnaise (not local except for the cilantro I added to it) and slathered it on the roll. 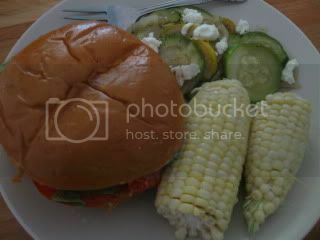 On the side I had sauteed zucchini, yellow squash and onions topped with local chevre and some corn on the cob. A quick and easy local feast! It's amazing how creative you can get when your refrigerator is overflowing with vegetables and you're just not sure what to do with them before they go bad. 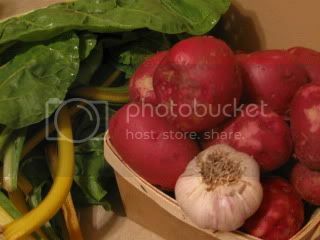 As for my CSA shares, week 7 was a little sparse again: a quart container of red potatoes and a head of new garlic. The good news is we had a potluck at the farm today and found out things are about to get a bit overwhelming. Because the planting schedule was pushed back a couple of weeks, we're looking at an upcoming onslaught of green beans, tomatoes, peppers, squash and zucchini, eggplant and more starting the first of August or so. I'm really looking forward to seeing what the summer brings! The greenhouses are overflowing, the fields are getting greener, the blackberries are ripening...and because of the delay in planting it looks like we'll be getting vegetables well into November and maybe even December. I'm already dreaming of fresh, local holidays! While I managed to squeeze in a local lunch last week consisting of grape tomatoes, mozzarella and basil drizzled with balsamic vinegar and olive oil, I didn't get time to write a post about it or take any pictures. This week almost went by without a post, too, but I remember this morning and made up a delicious local lunch to share for week 6 of One Local Summer. A trip to the farmer's market this morning gave me great ideas for local meals in the coming week. I brought home ingredients galore. 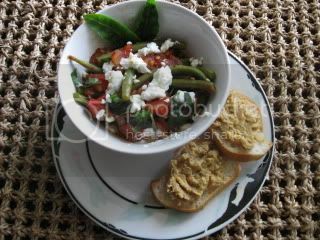 For today's local meal, I started with green beans and got creative. First, I steamed some green beans while I sauteed onion and garlic in some olive oil. When the beans were done (about 5 minutes) I tossed them in with the onion, one diced tomato, a little salt and pepper and a couple tablespoons of balsamic vinegar. I cooked it down for a few minutes, tossed in some fresh basil and then dished it up. I topped all that with a tablespoon or so of crumbled chevre. For a little added oomph, I sliced up a baguette and topped a couple slices with a dollop of smoked hummus from Neopol Savory Smokery, which I only recently discovered although I've been walking past their stand for two years. The smokey hummus flavor is something I never would have considered if I hadn't tried a sample the last time I was at the market. I'd been thinking about it ever since and went prepared with a few extra dollars this week so that I could treat myself. It was well worth it, and I'm already thinking about trying their smoked salmon next time. The local low-down: All ingredients were local except olive oil, balsamic vinegar, salt and pepper. 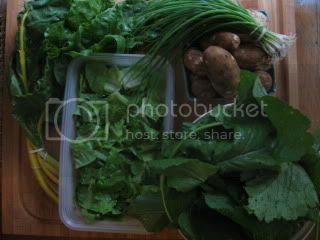 I'm doing a quick CSA post to document my shares for the last two weeks--without pictures because I forgot to take them before I started eating the food--so that I can keep track of what I've been getting. I'm particularly interested in seeing how different my shares are this year from last year due to the rainy weather we've been having. It's not much, but along with my farmers market finds, I'm eating well!